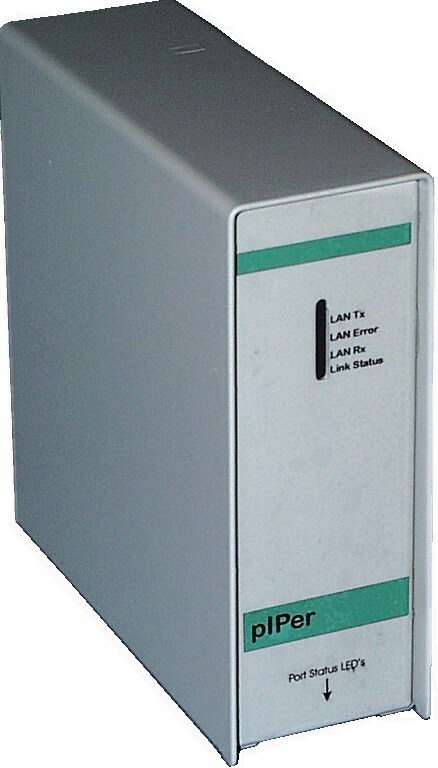 StarBus pIPer/TNC allows you to communicate with all sorts of RS-232 equipment over your local or wide area network. You can access the menus of a remote devices or obtain alarm messages and data right through the Ethernet port of your PC. There is no need to have a pIPer at your desk. pIPer/TNC uses the same hardware platform as our regular pIPer but with special firmware. Features can be flashed back & forth between these versions using a TFTP utility. The regular version supports box-to-box communications (commands and data enter via serial port on any pIPer). The TNC version supports communication in both directions between a pIPer and an Ethernet-equipped PC - but not independent communications between pIPers. Simply run a Telnet client on your workstation and enter the IP number of the StarBus pIPer/TNC unit you wish to connect to. StarBus pIPer/TNC turns the keystrokes from your workstation into characters on its serial port, and returns the responses from your equipment back to your screen. To make things even easier, you configure StarBus pIPer/TNC using your favorite web browser. Choose serial port baud rate, data bits, parity etc. on simple pull down choices and click to save. StarBus pIPer/TNC saves the settings and restores them each time it is powered up. You also manage the Telnet server in StarBus pIPer/TNC using your browser. For example, you can see who has a Telnet session open. As new features are released you can upgrade StarBus pIPer/TNC software over your network using TFTP. Telnet Is a standard TCP/IP application often used for configuration of routers and other network devices. It is provided with Win95/98/ME and is located in the Windows directory. Double click TELNET.EXE, or create a shortcut on your desktop. Many programs from other authors can be found on the Internet. We suggest Tera Term, a terminal program that supports both serial and Telnet sessions. It is very simple to use -- simply Connect by specifying the IP number of a remote StarBus pIPer/TNC unit, and Disconnect at the end of your session. TFTP Is a simple version of the familiar FTP (File Transfer Protocol). TFTP client programs are available for all major operating systems. They typically offer an explorer style interface to copy a file to a network box by specifying its IP number. Try 'PumpKIN' which is available at internet shareware sites.